The Olive Thrush was the first to make it onto my February bird list. 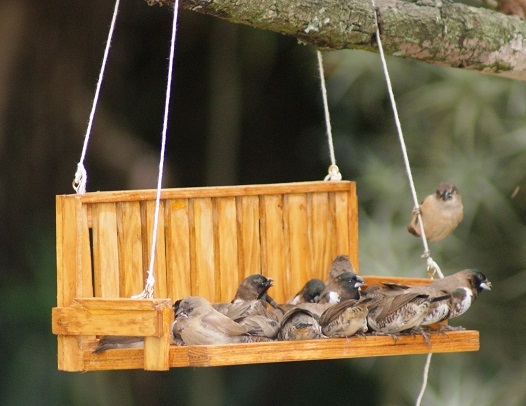 I have featured these lovely birds several times as they are a joy to watch in the garden. As dry as it is, they still manage to find food by turning over the fallen leaves and keeping a beady eye out for anything that moves in what is left of the lawn. They relish the apples I put out too. 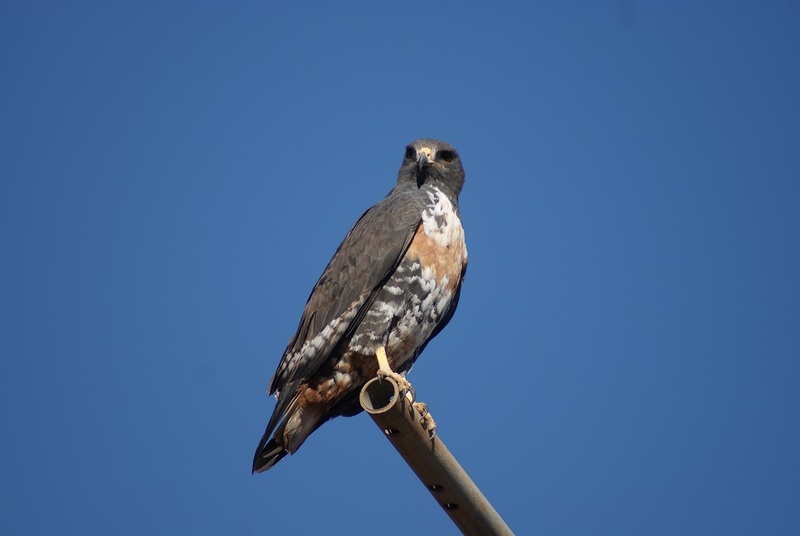 February has been a busy month for me, leaving me not nearly enough time to enjoy the avian visitors to the garden. Two very welcome first-time visitors this month have been a White-starred Robin – the first time I have ever seen one in our garden – and a Brown-hooded Kingfisher. I have heard the calls of the latter for several weeks, but this month it was out in the open more than once. The Speckled Pigeons are flourishing. This couple was eyeing the seeds on the ground below them. 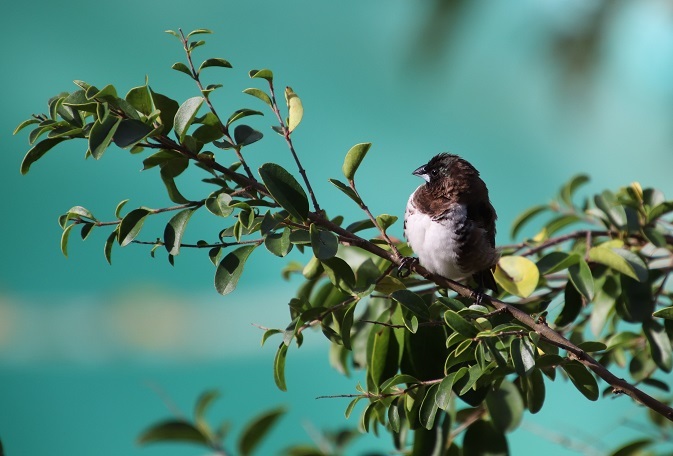 It cannot be an easy time for the birds now as the plants have dried to brittleness in the scorching heat and nothing new is growing thanks to an ongoing lack of rain. I fill the bird baths several times daily and provide a supply of seeds and fruit. The Bronze Manikins eat the seeds either early in the morning or later in the afternoon, once the main rush of feeding birds has gone. The nectar feeder has to be topped up regularly too in this hot and dry weather. 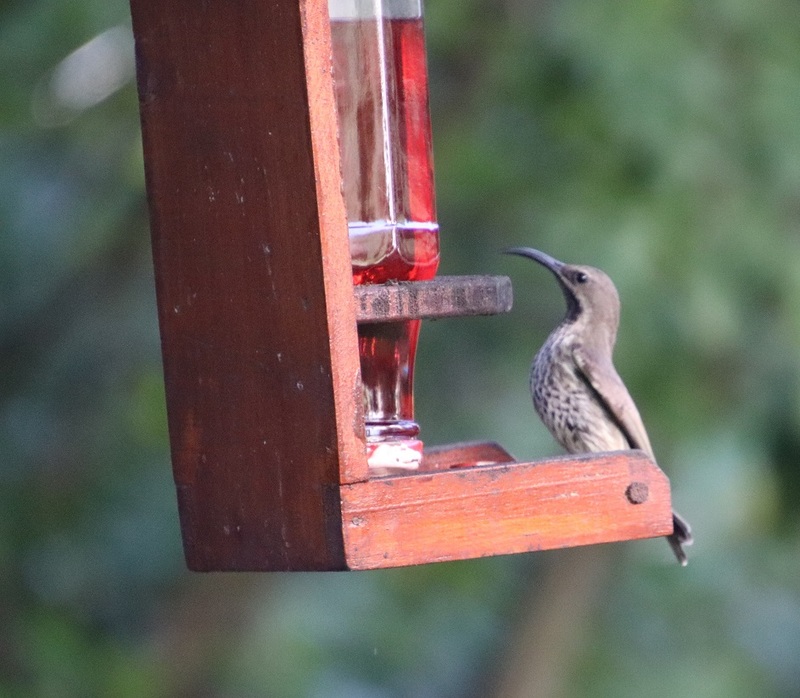 Here a female Amethyst Sunbird pays it a fleeting visit. Birds must be tougher creatures than they look, for I see and hear them daily. While this month’s list is shorter than I recorded for last month, I feel privileged to still enjoy their company. African Green Pigeons play hide-and-seek, calling mysteriously either from the Natal Fig or the Erythrina caffra during the late afternoon – perhaps when they come to roost – but provide only fleeting glimpses of themselves. 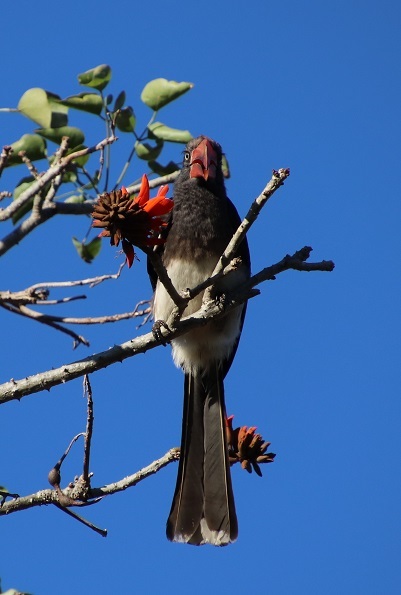 A pair of Knysna Turacos purr and snort softly within their leafy world – they move silently for such large birds – so I felt privileged watching them flitting through the foliage the other day and drink from the stone bird bath situated in the shade. The Black-collared Barbets are also heard more often than they are seen these days, although three of them spent a leisurely time feeding on the apples I had put out this morning. 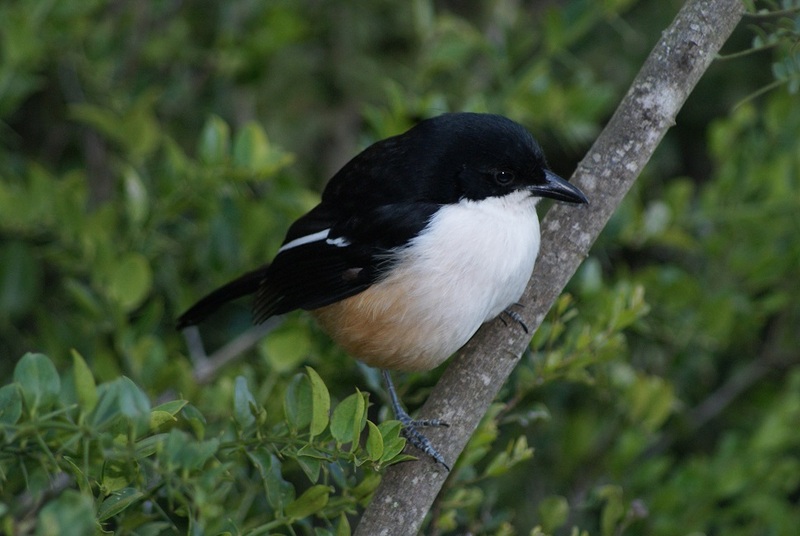 It is an odd time of the year to be hearing the familiar calls of Klaas’ Cuckoo and a tad disappointing to see so little of the Cape Robins, although they continue to sing quietly from deep within the undergrowth. Waves of Cattle Egrets pass over every evening, having kept the Urban Herd company during the day, as they head for their chosen roosting trees in the centre of town. May is an in-between month of warm days followed by cold; of a warm Berg Wind shaking leaves from trees heralding days of gloomy skies and dampness; it is a month of weak sunshine and dark nights … the birds may come and go, but there are always enough around to provide real pleasure! Thanks to the interest some of you have shown in the fate of this pair of swallows ever since their original nest fell down (see THE HOUSE THE SWALLOWS BUILT 2nd December 2014), I have been especially vigilant about checking on their progress. It appears that Lesser-striped Swallows have a tendency to return to the same nest every year. Certainly we have had a pair nesting in the same place under the eaves for several years already – and feel rather privileged to be hosting them.They are not the only pair in the suburb, for during some late afternoons I have counted sixteen or more of these beautiful birds flying across the garden or wheeling into the air whilst emitting their characteristically high-pitched ‘chip’ and ‘treep, treep’ sounds. The other day I was alarmed to note how much energy this breeding pair expended on repeatedly chasing off an aggressive pair of Fork-tailed Drongos, which are known to eat young birds. 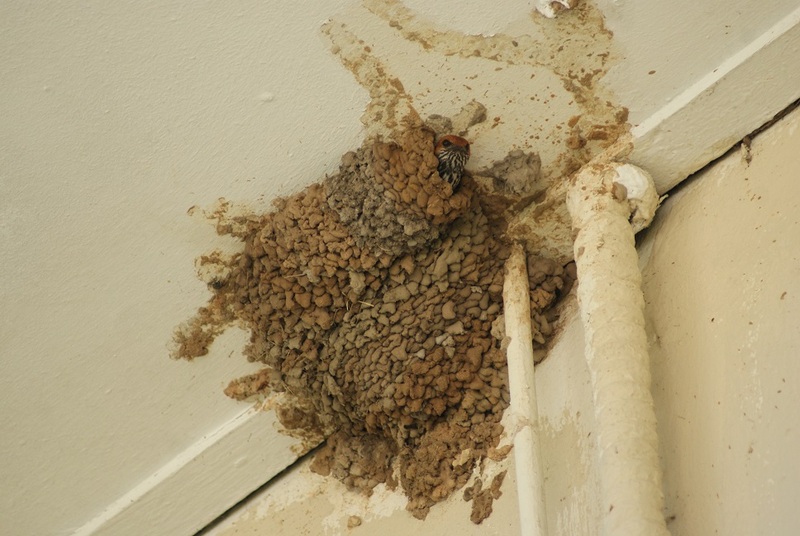 I wonder if they actually raid nests and were the cause of the first nest collapsing? 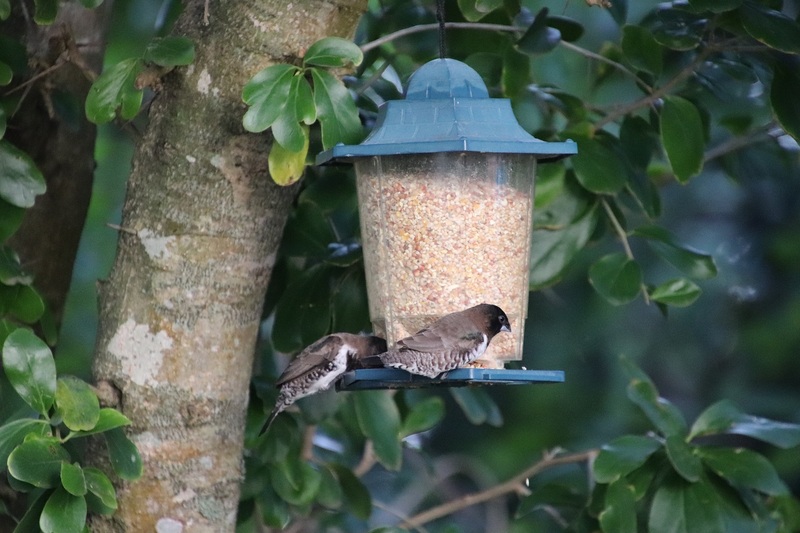 This has been a bumper month for watching birds in my garden. 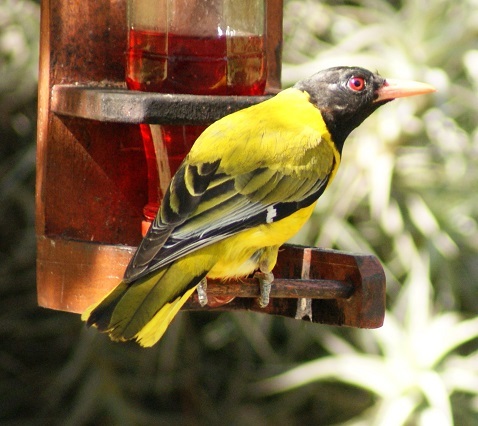 Some Southern Masked-weavers have been spotted among the regular flock of Village Weavers that descend on the garden in search of food. I have never seen them in large numbers. 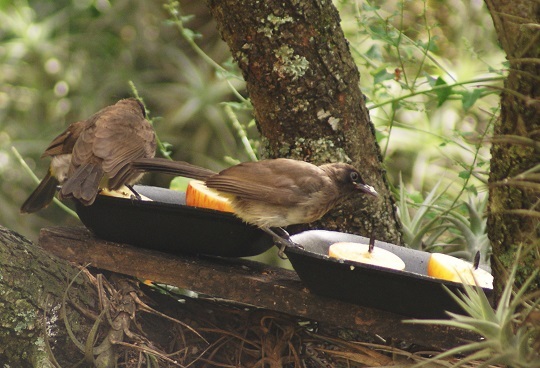 It is evident that some of the Village Weavers are in the process of moulting: I regularly see a few with a feather sticking out awry and this morning had a wing feather float down to land on my tea tray. Looking at it closely, I see the edges look worn although the rest of the feather looks fine to my eye. 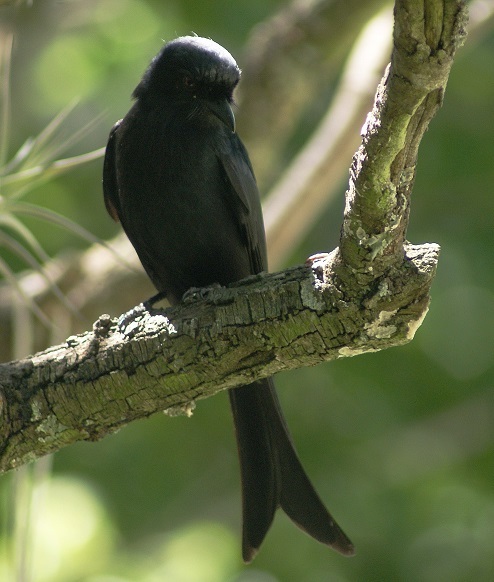 I attended an interesting series of lectures this week and discovered that the Bronze Mannikin has only been noted in our town since 1994 and since then has become so well established that it breeds in this area. 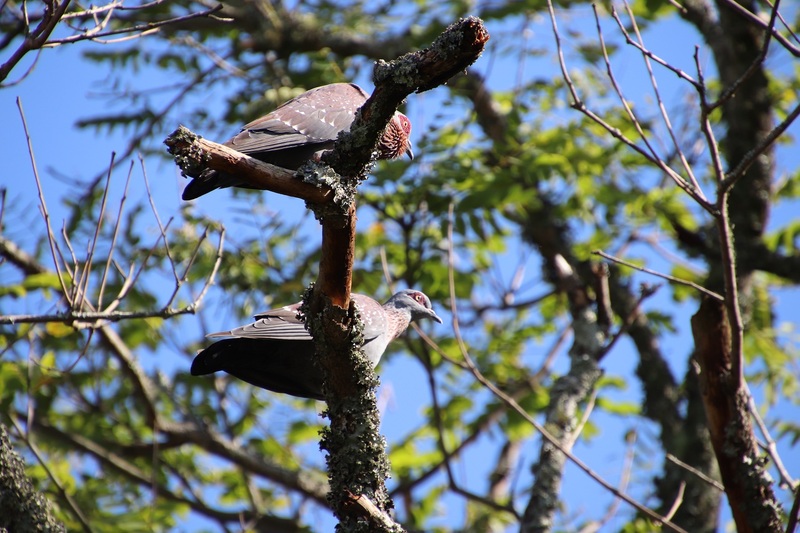 African Green Pigeons arrived here in 2005 and can now be seen or heard daily – as I can testify from those who call from their well-camouflaged perches in the fig tree – and have also been known to breed here. Interestingly enough, there has been no sign of a Pin-tailed Whydah so far this year. I have not even heard one in the neighbourhood.